Additional funding has been received from the federal government which was earmarked for the expansion of HKNC’s ability to address the gaps in services and strengthen options for the provision of services to individuals at the local level. Ten deaf-blind specialist (DBS) positions have been created – 6 of which have now been filled. The primary focus of the DBS will be to provide individual services to consumers to assist with the achievement of employment outcomes in keeping with HKNC’s mission of supporting a person’s desire to live and work in their community of choice. They will also offer training and technical assistance to families and service providers and will assist HKNC’s regional representatives to build capacity within the states. Roz Kia, CSC’s Project Coordinator, and Leah Neumann, HKNC’s new Deaf-Blind specialist, sat down to discuss Leah’s new position. Let’s peak in! R: Hi Leah! Welcome! Please tell us a little about yourself. L: Hi everyone! My name is Leah Neumann and I recently moved here from San Diego, California to work as a HKNC Deaf-Blind Specialist on island. I provide person-centered services to help individuals with combined vision and hearing loss work towards employment. I am also the representative for the National Deaf-Blind Equipment Distribution Program (iCanConnect Program). R: For those who aren’t familiar, could you please tell us about the Helen Keller National Center? L: Sure! Authorized by an Act of Congress in 1967, Helen Keller National Center is the only organization of its kind—providing training and resources to people who have combined vision and hearing loss. Students travel from across the country to our headquarters in Sands Point, New York, for on-campus training in assistive technology, vocational services, orientation and mobility, communication and independent living, and our regional offices bring HKNC resources to communities throughout the United States. R: One of the HKNC announcements I saw, says that you will be the representative for Hawaii AND the Pacific. What geographic areas do you cover? L: I cover Hawaii, Guam, Northern Mariana Islands and American Samoa. L: First of all, Hawaii, Guam, Northern Mariana Islands and American Samoa are all extremely beautiful islands! I feel blessed to be able to live and work in Hawaii and cover such a breathtaking geographic region. I actually used to live in American Samoa for two years working as a Teacher for the Deaf. I’m excited to go back later this week as a representative for HKNC and the iCanConnect program. Also, I recently returned back from my first ever trip to Guam and the Northern Mariana Islands. It was a great experience and it was nice to see the number of consumers in this program continue to grow. R: Cool! As their rep, what will you be doing? L: I will be working as a JOB DEVELOPER for individuals with combined vision and hearing loss and a RESOURCE to individuals, families and vocational rehabilitation counselors. R: You mentioned the iCanConnect program. Could you tell us a little more about that? L: iCanConnect is an amazing program provided through the Federal Communications Commission. I am the iCC representative through Helen Keller National Center for this region. We supply FREE telecommunications equipment and training to individuals with significant combined vision and hearing loss who are in a specific income range. R: Sounds like you are going to be a valuable resource for Hawaii and the Pacific. If someone wants to meet with you, where can they do that? L: I am based out of the Comprehensive Service Center for the Deaf, Hard-of-Hearing and DeafBlind in their Shared Deaf-Blind Services office. You are welcome to drop in to meet me or make an appointment to meet at a specific time. R: We are so thrilled to have you here! You recently joined our Media Specialist Ryan Marshall at the Pac Rim conference. What was that like? 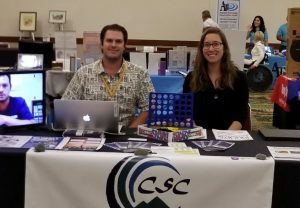 CSC’s Ryan Marshall (left) and HKNC’s Leah Neumann (right) sitting at an exhibit table at the Pac Rim 2019 Conference. L: It felt great to share a table with the CSC. Ryan and I were able to network with many different organizations and members of the community in order to share what programs we have to offer. I feel so fortunate to be connected with the CSC and look forward to continuing to work together in order to best serve our community. R: Do you also do home-visits? L: Yes I do home visits. In my HKNC DeafBlind Specialist role and also as the representative for iCanConnect, I can meet consumers at their home, in my office at the CSC or at a location in the community. R: Now that we know all about what you do, can you tell us a fun fact about yourself? R: A twin!? That’s so cool! Identical or fraternal? R: Neat! What’s your favorite quote? L: My favorite quote is, “Today you are you! That is truer than true! There is no one alive who is you-er than you!” by Dr. Seuss. I think it’s important to always be yourself and love yourself for all of your qualities. R: I love that! Lastly, what is your contact information? R: Thank you Leah! We are thrilled to have you stationed at the CSC and look forward to collaborating on various activities and workshops! L: Thanks for having me!